Many [tag]basketball coaches[/tag] struggle to come up with drills for [tag]correct basketball shooting[/tag]. Here is one [tag]basketball[/tag] drill that one of my subscribers sent to me. Give this one a try and let me know how it goes! Obviously most of us have [tag]basketball drills[/tag] that we have “borrowed” from other coaches and it is hard to think of different drills that most people don’t already know. Therefore I am giving one that I learned this year. It is a [tag]basketball shooting drill[/tag] called “Beat the Pro.” For every three shots taken the “Pro” gets four points. 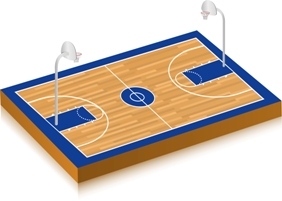 The shooter is allowed one three-point shot and two fifteen foot jump shots before the pro is allowed four points. Points awarded to the shooter are regular scoring (three points and two points). The first to 20 wins. Obviously after five sets of three shots the “Pro” will win if the shooter did not make any shots. The shooter is encouraged to call out his/her score after each basket made. To make it more exciting you can have another shooter at the end of the court competing against the “Pro” and the other shooter.